Turbulence Ahead: Are We There Yet? Anyone who has ever driven with young (and not so young) children in the back of the car will be familiar with the question 'are we there yet?' It's a bit like that for economic forecasters at the moment: investors, workers and politicians desperately want to know when will we be at the bottom of the recession, after which recovery sets in? As I've noted before: the future is emotional. 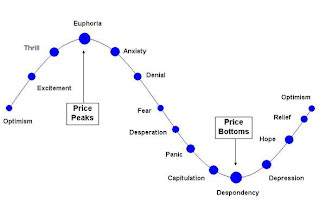 At every stage in the business and investment cycle there is a predominant emotional feeling about the future - as illustrated in the chart. Certainly there is a strong correlation between measures such as consumer confidence (confidence is by definition a future-oriented emotion) and 'real' measures such as unemployment, investment, inflation etc. The BBC's excellent documentary over the weekend on the 1929 Wall Street Crash illustrated the extraordinary power of psychology to turn a market. To this day nobody actually knows why there was a sudden sell off of shares on Black Thursday, 24th October 1929, precipitating even worse falls the following week. But we can go further with this analysis. Will Wilkinson has an interesting piece on macropsychoeconomics on his blog today. His worry is that the 'herd' might overreact to the current economic difficulties by rejecting free markets and capitalism altogether. One policy implication might be to add Prozac to the water supply ... joking, just joking. Wilkinson suggests we need a longer term response to the macropsychology of the crowd: better economics education. He's right in principle, though it does rather depend on the quality of the economics education. As Anthony de Jasay laments, most of our economic textbooks (especially at secondary school level) actually teach students to detest business and free markets via scare stories about labour exploitation and inequality. But back to whether we are there yet: the good news for Irish investors is that shares lead the recovery, with the headline economic indicators (trade, output) following. The bad news for the unemployed is that recovery in the jobs market tends to be a lagging indicator of recovery. But unfortunately for investors (and everyone else) we're not there yet.